Residents voice their concerns over the proposed uses for the Ox Ridge property acquired last year for $6.2 million. Picture taken at the Darien Town Hall on Monday . DARIEN — First Selectman Jayme Stevenson, following the approval of the proposed uses for the Ox Ridge property, stated that additional work would be done to consider the impact of traffic and access in the area. “There will be a traffic study and an analysis of where the best egress and parking should be so as not to exacerbate any traffic conditions and that is yet to come,” Stevenson said. With member Kip Koons abstaining, the other four selectmen voted to pass a proposal for approved uses for the 16-acre Ox Ridge property Jan. 29. The proposal will now be translated into a special permit that the Planning and Zoning Commission will review leaving room for possible modifications and more public input from residents. Ultimately, the special permit, if approved, would grant the Parks and Recreation Department the authority of scheduling events on the property. Over 20 people attended the meeting Monday. 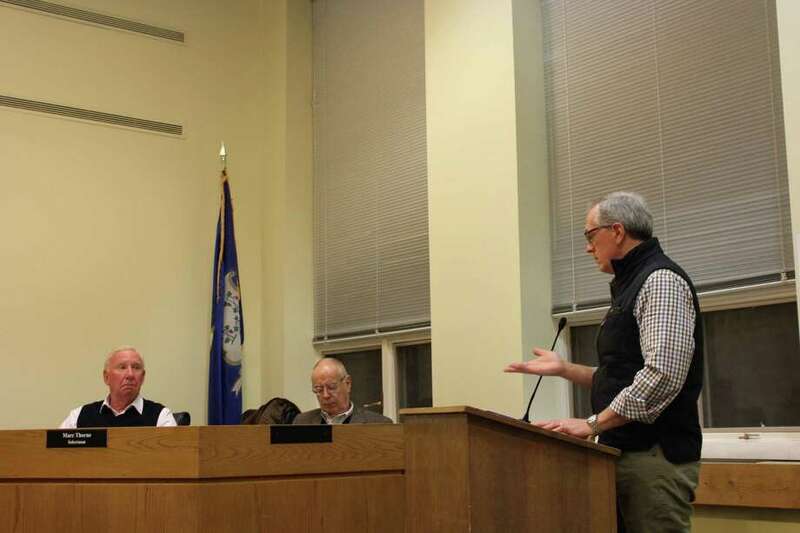 A total of nine Darien residents, including four RTM members, publicly voiced their concerns to the selectmen, with seven of them arguing that open space should be a foremost priority. Joanne Hennessy, a member of District 5 and chair during the negotiation of the $6.2 million Ox Ridge purchase, noted that the RTM wanted to be sure that this benefits the whole town as much as possible. “We had to amend the terms of the original declaration. It says we can allow for athletic fields, though no turf, required parking ancillary to activities and passive recreation. There has to be parking or people cannot access it. We wouldn’t have approved it if we couldn’t access it,” Hennessy said. Other RTM members Jack Davis, Curtis Butler and Patrick Keane also made public comment. Davis agreed with Hennessy’s statement while the other two members pushed to keep the property for passive recreation and an open space. Selectman Pam Sparkman, a proponent of leaving Sundays unscheduled, opted to abstain from modifying that in the proposal. It’s a factor that will eventually be a decision for the Parks and Recreation Department to consider. “If we tie their hands, they’re going to come back to us and we’re going to have more administrative issues,” Sparkman said. Residents will be able to publicly comment on the Planning and Zoning Commission review of the special permit. “I do believe there will be as much public input when the special permit process begins but it’s in the hands of the Planning and Zoning Commission now to review,” Stevenson said. Koons, who has been a financial consultant for the Ox Ridge Hunt Club since November of last year, recused himself from the vote so as to prevent any apparent conflict of interest. Andrew Millar, an RTM member, had a copy of the contract signed between the Ox Ridge Hunt Club and the RTM. “It’s very clear that this is what we wanted, it’s all in the contract,” Millar said referring to the recently approved uses.